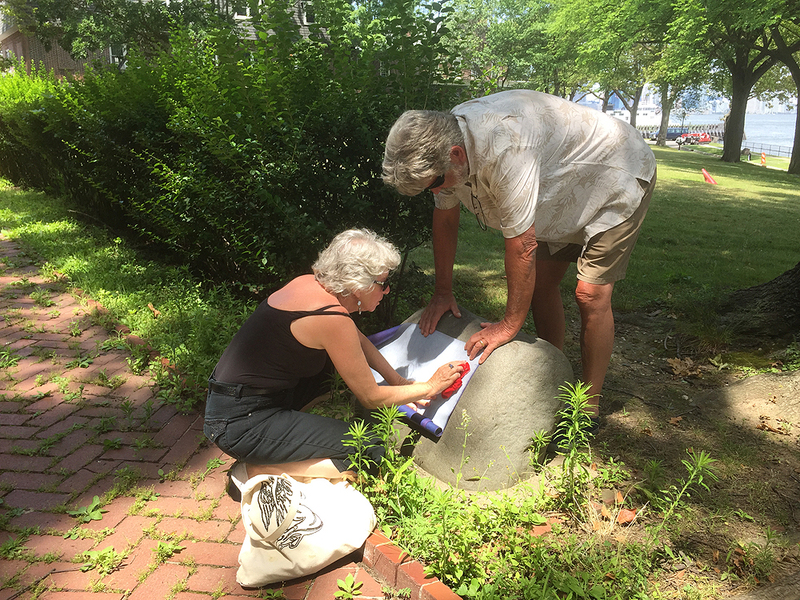 Beth and Peter Woolley, owners of Peaceable Kingdom Memorials, measure the Pershing Oak stone. Progress can be measured—and was measured—on the Governors Island World War I Memorial Project this week. Of the three bronze tablets in the project, one is restored and ready to be installed, and the other two are about to be cast by the foundry. On Monday, Beth and Peter Woolley and I went to Governors Island for an important site inspection. They are the owners of Peaceable Kingdom Memorials in Neptune City, NJ. They are restoring and overseeing the casting and installation of the bronze tablets that are missing. Their company has decades of experience in the monuments and memorials business. In a fine piece of island karma: Beth’s Russian immigrant grandfather, Max Duze, was stationed on Governors Island and was awarded the Silver Star for heroism in France during World War I. The status of the Governors Island WWI Memorial Project is that everything is on track for completion by September. A previous blog explained the whole project. The Hay Road tablet is restored and looks brand new. This is the tablet to honor Private Merle David Hay, one of the first three Americans to be killed in the Great War in November 1917. The other two plaques were the reason we went to the island this week. Bronze screws are used to measure on the Pershing Oak stone. 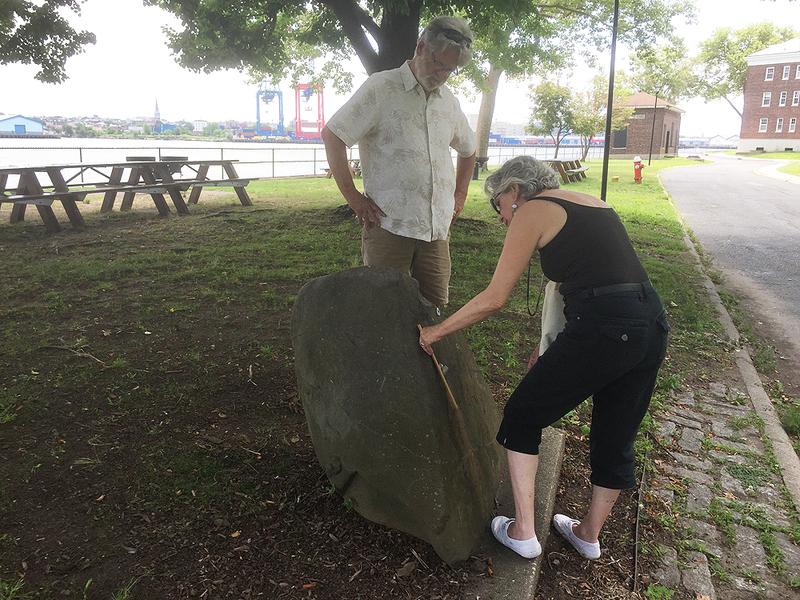 Beth and Peter needed to measure the boulders that are going to have the Pershing Oak and Kimmell Road bronze tablets installed. These are the two missing ones, and new tablets are being cast at Matthews Bronze. We are going to use the same big rocks that are already on the island. I had previously measured the space where the holes are drilled out, but my measurements were not lining up with what we thought. Before casting the tablets we had to make sure the reverse sides would line up with the existing holes. We spent more time on the Pershing Oak. This was dedicated in 1960 on the centennial of the birth of General John J. Pershing, who departed Governors Island for France in 1917 (about 100 yards from the tree memorial). The spot is in front of Pershing Hall, the 1934 landmark that was once the headquarters of First Army. Beth used tracing paper to rub the exact locations of the tablet. Then with a pencil marked the correct spots. Measurements were taken to get it right. 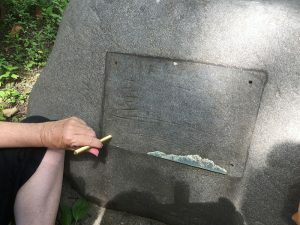 The Kimmell Road memorial is measured for the replacement bronze tablet. For Kimmell Road, named for Capt. Harry Kimmell, awarded the Distinguish Service Cross and killed in action, the site inspection was needed. The boulder still has the holes that were drilled long ago, but the rock is uneven. We needed accurate measurements taken. This is a beautiful location overlooking Buttermilk Channel, and didn’t take too long. Beth and Peter will come back to the island in early September for the installation of the memorials. The rededication ceremonies will take place September 16-17 during the grand World War One History Weekend, sponsored by the WWI Centennial Committee for New York City. More updates will be posted soon. Kevin C. Fitzpatrick has written and edited seven books with ties to New York history, including "The Governors Island Explorer's Guide" and "World War I New York: A Guide to the City’s Enduring Ties to the Great War." Kevin is a licensed sightseeing guide and has been leading walking tours since 1999. He resides in Manhattan.